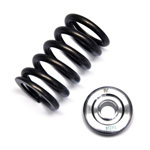 Designed for high rpm, BC valve springs by PAC Racing are wound from only the highest grade, super clean, chrome silicone alloy and feature proprietary processing procedures for consistent pressures. BC titanium retainers are CNC machined from 6AL4V round bar titanium to exacting tolerances. 6mm stem diameter, 6° billet performance valve stem keepers or locks are designed to fit BC and OEM retainers. Precision machined from premium billet bar stock chromoly steel and heat treated for maximum strength to insure against shoulder shearing (common with stock and lesser quality brands).